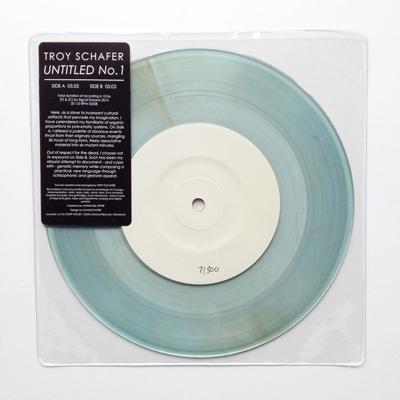 “Untitled No.1” is Troy Schafer’s documentation of the fantastic result of his determined (re)search through truly unsettling cloud of sounds. Inside his curiosity room and laboratory, Schafer dissects, explore, create and contaminate sound sources, welding the emitted waves into a crystalline schizophrenia between monolithic hosannas and alien spectral minimalism. Schafer takes everything, from violin and viola to glass and steel, and makes a spirit out of this broken body. Side A is an almost six minutes long result of a 36 hours long experiment, while Side B offers a more cryptic explanation for his nature, and it sounds, incidentally even more cryptic and challenging. You can get this remarkable lab creature either on bandcamp or better – on a beautiful vinyl.